President Donald Trump tempered his optimism on North Korea on Sunday the 22nd April 2018, saying that “only time will tell” how things turn out, as US lawmakers sounded skeptical about Promises made by Pyongyang ahead of possible historic talks between the Countries leaders . Economy in North Korea is suffering and Kim wants to take this route and may again take a U Turn unexpectedly. This will be a Miracle if Kim abandon’s his nukes , since all the major wars in the world have taken place when Mars and Ketu were conjunct and near the Eclipses . Also the Principle of Mars proving Ammunition dump activating the eclipse point will also fail, when North Korea Foundation chart crystal clear shows the Dasha and Antar Dasha of Planets connected to the 7th house shows country involvement in war like condition. Further the Placement of Mars in the 12th house making him a first class War mongering Country as per K N Rao. and Natal Mars aspects the 7th house by 8th strong aspect. The Transit Mars and Ketu in the square position from the Natal position in the 3rd house of the neighbours in very close degrees on the 8th June, 20th-28th July at the time of the Eclipses and then on the 26th Sept. 2018 when Mars will activate the Eclipse point of the Lunar Eclipse of the 28th July 2018 could prove most venomous . I utterly fail to give the explanations how this Man all of a sudden will give up his Nukes. This is something I cannot digest as per Astrology principles , but certainly good for the world . I wish My Predictions go wrong for the Brawl between Trump and Kim. In My Article “Roman God Saturn, Red Planet Mars, South Node Ketu In 2018-2019: What They Have Up Their Sleeves ?” link https://www.astrodocanil.com/2017/12/roman-god-saturn…up-their-sleeves/ dated 23rd Dec. 2017 I have analysed that all the major wars have taken place when Mars and Ketu were in conjunction and Mars proved as Ammunition dump and activated the Eclipse point at the time of war. In the Present Scenario the Dates 8th June, 20-28th July and then 26th-27th Sept. 2018 can prove most venomous in this respect . 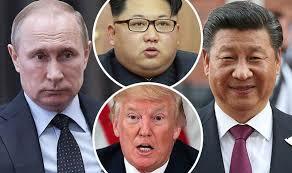 According to me there is a Treaty between the North Korea, China and Russia and for the time being Kim may take a back seat and supply his Missiles to Iran. Kim is a Hard Nut to Crack . The Initiation will start from the 8th June it so seems and finally take an explosive shape around the Eclipses in July and then in Sept. 26-27th 2018. Written on 22nd April 2018 19.20 hrs. ← Opposition Moves For Chief Justice Dipak Misra’s Impeachment; What Stars Foretell ?